After trying out almost all the products from Oriflame the one range, I have shortlisted few products that I really liked and I think you guys should totally check them out. First product in my list is the Oriflame The One Eyeliner Stylo in Black, It's my favourite among all the products and if you are a sucker for eyeliners, I think you should totally have it must have. I can make thin as well as thick lines with both the Eyeliners easily. The liner does not sting my eyes and dries up quickly and does not smudge. To know more about the product, SEE HERE. I hardly use any mascara and when I do, I want it to look natural and don't want to end up having spidery lashes. I am in love with Oriflame The One Volume Blast Mascara. The tiny bristles of the wand helps to coat each lash with ease and the mascara does not clump or flake. It looks really natural and not made up. The ONE IlluSkin Compact Powder is my current favourite. It evens out my skintone, covers redness and keeps my face matte. I wish it was available in more shades. The one range has some really pretty summer colors. The nail polish has a glossy finish. The brush is thicker and wide in comparison with other nail paints and has a curved tip, which makes the application easy and less streaky. To know more about the product, SEE HERE and HERE. Cream Eyeshadows come handy while in hurry. They blends easily and there is no need of using a brush too. The eyeshadows can be used alone or can be used with other colors. You can also use them as colored eyeliners. We all love wearing matte lipstick but they tend to make our lips dry and flaky. This is the reason I love the Color Unlimited Lipsticks. They have pretty colors to choose from, very moisturising, fairly pigmented with Moist-Matte finish. To know more about the product, SEE HERE, HERE and HERE. Hope you guys enjoyed the post. 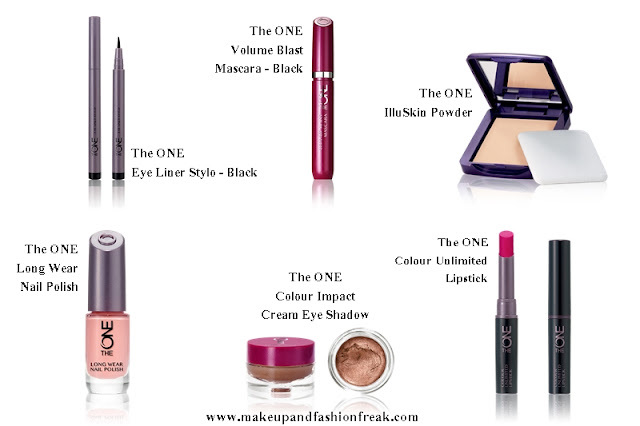 Let me know what's your favourite product from Oriflame The One Range.